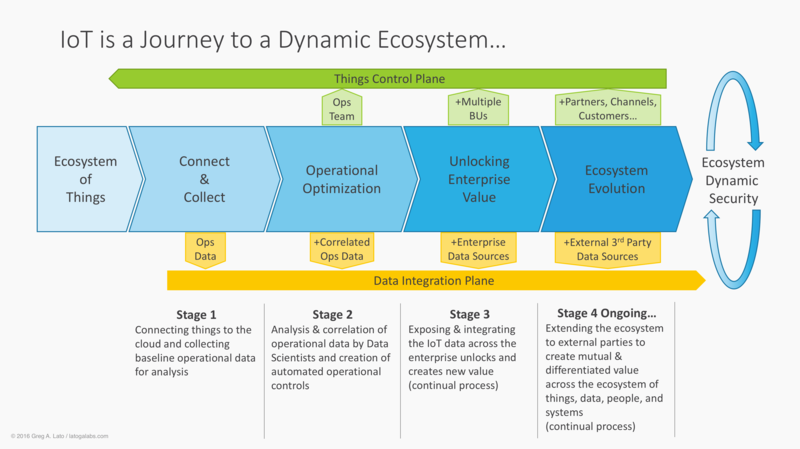 IoT is a Journey to a Dynamic Ecosystem…What’s Your Destination? All the IoT related discussions I’ve had starts off with one or more types of Things. Stage 1 is always connecting that Thing to the Internet (link level initially and eventually data communication level) and then collecting data from that Thing. I’m actually a bit amazed at how many customers, in early stage projects, have no vision of what’s beyond that! They are usually focused on just the operational data that can be captured from the thing and collecting it into a big data repository of some sort. Yet so many don’t focus on the operational aspects of all these things out there…how to efficiently scale their connection to your solution, keep them all organized, and track their state within a lifecycle. Some ignore this need all together while others try to build this operational capability (taking time away from adding true value). Stage 2 is the logical extension of Stage 1, I have all this operational data…let’s analyze and optimize! This is where a data scientist may be employed to analyze all the collected data to understand trends. If we’re talking about Industrial Internet of Things then they are looking to predict when a Thing may fail and/or optimize it’s run time state. Even for the Internet of Other Things, there is still a need to understand the state of a thing to optimize it’s usage (like turning off the Thing when outside it’s hours of usage). Being able to allow certain people or systems to send commands to a Thing over a control plane is key in order to mitigate a failure or negative consequence of a failure. And integrating with other operational data sources in real time to broaden the operational view. Stage 3 is where most of the more advanced customer’s I’ve talked to have their visions initially set. They know they need to expose and share the data and access to their Things with others. And this is where the excitement builds for them as this is where new revenue generation models get defined…and redefined. This is also where I start to shake my head at a few “IoT Platforms” that have come along recently that claim to help solve the monetization problem of IoT. Monetization is the secret sauce that you need to create for your IoT Solution. Someone else can’t do this for you. The true root of the monetization challenge is being able to support dynamic ecosystem security, a method of controlling access across the entire ecosystem of people, things, and systems in a fashion where you can programmatically change the access levels. Without that that type of security model you can’t control which different groups of users have access to different aspects of a Thing and charge for the increased value that is provided. Stage 4 is the constantly evolving stage (not calling it an end state as this journey doesn’t end) that true visionary companies and projects seem to have, one that involves sharing of their data and Thing access across multiple 3rd parties and combining it in real time with multiple 3rd party data sources. The number of different users and groups who need access to the control plane as well as the number of data sources hooked together on the data integration plane is complex and evolves with the demands of the business. This is my view of how IoT is a Journey…where do you agree or disagree? In case you didn’t notice from the change of tone in my tweets, I have been on vacation with the family for the past week. Enjoying the scenic grandeur (and at times solitude) of the Pacific Northwest and taking a ton of photos with my new camera (1388 photos to be exact…and 5 movies…). Today, I had the joy of the first day back on the job and dealing with the flood of emails, followups, and catching ups that is the price we pay for taking some time off and not reading emails. Like that wasn’t enough, today VMware (my employer) had to go an announce that we were acquiring SpringSource (and add a few more items to my list to completely dissolve that post-vacation glow! 🙂 ). After a day dealing with my inbox and urgent items, I had to take some time out of the evening photo processing to read the Steve Herrod and Rod Johnson blog posts on the acquisition. And provide a bit of a different viewpoint on this acquisition…fresh from vacation and not knowing anything more about this acquisition than what has been publicly stated by others (so safe from saying anything other than my opinion – see disclosures in the About latoga labs in the sidebar). I’m not talking about my employer acquiring a company. I’m talking about a closed source Company acquiring essentially an Open Source company. Before joining VMware I used to work for IONA Technologies (sound familiar….think CORBA…Yes! That IONA!). I was there when IONA bought LogicBlaze. What made this acquisition interesting (especially for me…being part of the enterprise sales team at IONA) was that we went from having 1 closed source product (ESB) to three products (all ESBs) which competed with each other. And I was only allowed to sell one of them. Regardless of the synergies that two companies can provide each other technology wise, there is not as much focus traditionally placed on the social aspect of merging two companies. It is that social aspect (like the social aspect of introducing any new technology in a company) that will drive the speed and revenue value of the acquisition. Having been through this before in a rather painful way, it is important to mention this fact. The good news is that this conflicting personality issue shouldn’t be a problem with the VMware/SpringSource merger. First, there is no competing technologies between the two vendors. SpringSource allows VMware to access the higher level parts of IT (Applications and App Developers) while also working together to enable the Cloud Vision of vSphere. Second, based upon what Rod Johnson indicated in his blog post, he will be heading up SpringSource as a separate unit within VMware following the VMware BU organization. This should mean that SpringSource will get to work as they have been to support their existing community and customers in that classic open source way while working together with the other VMware BUs to add bigger picture value through the combination of SpringSource technologies with VMware’s. Paul Maritz has indicated in the past the need to move up the value stack of IT and has used the term framework more than once during the vSphere launch. The ability to leverage the virtualization foundation of vSphere with vApp and abstract away the applications from the operating systems with SpringSource’s various build-run-manage products not only provides a much more open application development environment to compete with Google and Amazon, but also provides an solid migration path for Enterprises to move to the Private Cloud with all their web based Java applications. Image a world where Java App developers have the ability to integrate via the spring framework right into the virtualization based cloud where their apps will be tested/QA’d/run. Regardless of weather…er…I mean whether…that cloud is an internal cloud or an external cloud. I see some very clear and interesting developments on the horizon from this acquisition which I’ll try to disclose my opinion on in the future. And, as is can be the case when you put a lot of very smart people together with solid management, I’m sure we’ll see some surprises as well. From the looks of my LinkedIn network, I’ll also be re-united with some old colleagues as well! Tomorrow will be an interesting day of conversations with my global clients to hear their take on things!